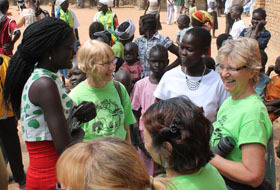 Thirteen Wesley-Knox members including CASS co-directors Glen Pearson and Jane Roy took part in the 2013 CASS mission trip to Gordhim, South Sudan. However, this year, only three took part: Jane Roy, Carol Campbell and Aben Kuol, the South Sudanese woman who cared for Jane and Glen’s adopted Sudanese daughter, Abuk, after Abuk’s birth mother died during the 22-year civil war that ended in January 2005. Why so few? First, there was concern about the hostilities that had broken out in the northeast part of South Sudan. While far removed from Gordhim, the situation had potential to change. Second was cost. 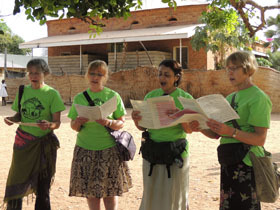 Fundraisers helped to underwrite part of the cost of the 2013 trip. The rest—about $5000 per person—was an individual financial commitment. This is not something most can afford to every year. Throughout this year’s trip, Jane attempted to keep in touch through e-mails. Service was sporadic, but all e-mails eventually got through. We have lightly edited them and formatted them into a PDF. You can read them here. All members of the CASS – Wesley-Knox South Sudan team (13 from Wesley-Knox, 16 in all) are back in London now, but we are still excited about their trip and the work they did in Gordhim, South Sudan—and even more excited after they reported on their experiences at a special Sudan Service on Sunday, February 24. Of course, team members came back with hundreds of photographs plus a number of video and audio clips. Right now they are busy posting the photos on the Shutterfly.com website. As soon as their album is available, we will post a link to it here. In the meantime, we offer a small selection of photos on this page. For over a decade, Wesley-Knox members Jane Roy and Glen Pearson have led the non-profit organization, Canadian Aid for Southern Sudan (CASS). 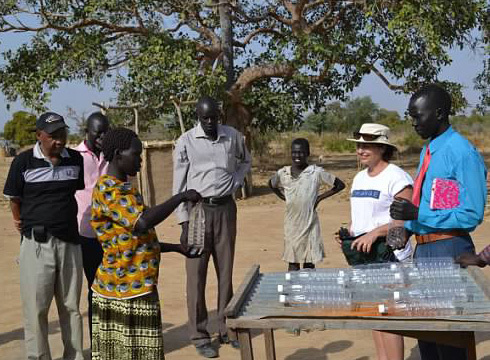 Throughout that decade, Wesley-Knox has supported Jane and Glen and CASS by raising funds and raising awareness of the needs and struggles of the people of Southern Sudan—now the independent Republic of South Sudan. A bit of history: Following decades of civil war and the loss of over two million people, the people of Southern Sudan were able to negotiate a peace agreement that resulting in their voting to become the world’s newest nation—the Republic of South Sudan. It was a stunning achievement that now permits Canadians more opportunities than ever to assist the people of this region develop stability and experience growth. The needs are enormous, but much good work is being done. 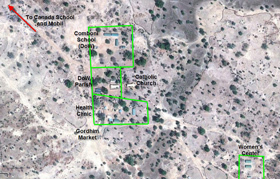 CASS has undertaken projects to provide clean water, develop goat herds, conduct women’s training classes, construct schools and assist female entrepreneurs by helping them to establish micro-enterprises. And through its ongoing support of all this, Wesley-Knox has been there. This year is special. 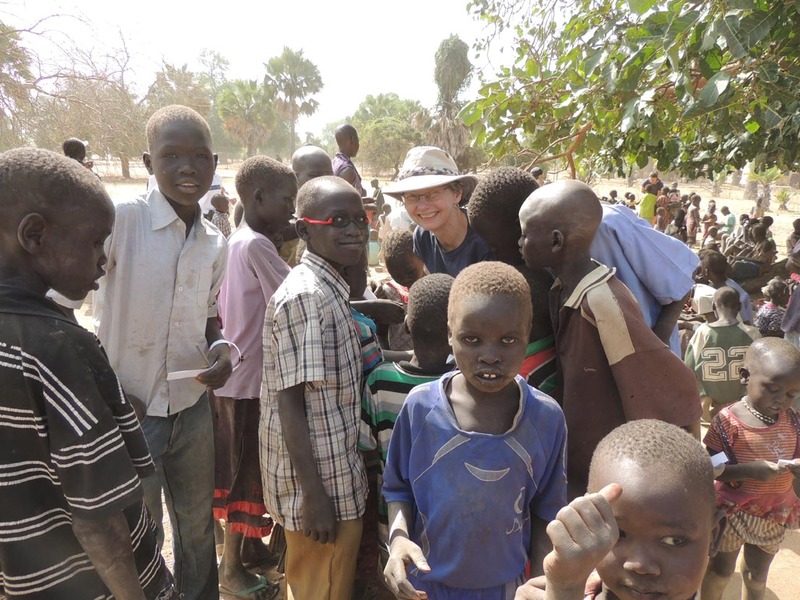 This January, the CASS team that travels to South Sudan each year will largely be made up of Wesley-Knox members—thirteen in all if you include Jane, Glen and son Ater. It is not an inexpensive trip. For each participant, travel, accommodations and a portion of the educational and medical supplies going to South Sudan add up to about $5000. While fundraising efforts have offset a portion of this, the trip still requires a major individual commitment. The remainder of this website page is divided into two sections. Immediately below, mostly notes and photos based on information we received from the field while the team was in South Sudan. 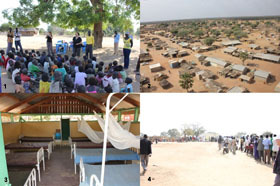 Below that, articles from past issues of the Wesley-Knox newsletter, the Kindred Spirit Connection, which offer background on the whole Journey with Sudan project. Conducted by HM who, by virtue of marriage, often works with Wesley-Knox’s Director of Music, Karen Schuessler. Karen was part of the CASS – Wesley-Knox South Sudan team. David Whiting advises that there are two other places you can follow the CASS – Wesley-Knox Sudan team: The CASS website here and the CASS Facebook page here. Please note that some reports from the field were edited for clarity. Yesterday, the last of our team members made it safely back to Canada. Karen, Carol and Denise were the last to arrive home from South Sudan via Nairobi and Amsterdam, joining Linda, Susan, Jessie, Sheila, Margaret, Maggie, Jane, Glen, Ater, Tony, Wes, Alex and Sue Gaskell who came back earlier. We are all doing well, though feeling the cold. It is a bit of a drop to go from 30- to 40-degree weather down to –15 degrees! We are slowly getting used to the time change. Some of us are still waking up at 3:30 in the morning and falling asleep in the early evening. But we are excited about sharing our stories and experiences with our families—and excited about sharing them with the congregation as well! On February 24, we are going to take the worship service and start the sharing process. So come prepared for the lessons, stories and songs! 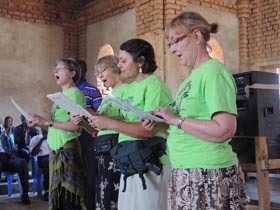 After church on February 24, we will share even more of our photos and take more time to talk about the trip. A short text message from Jane. After receiving the report above, Neil Eadie e-mailed to say he had spoken with Margaret in Nairobi, and later we heard again from Jane. Sent again from Maggi Logan’s Hotmail address, forwarded by Josh Chadwick at London Food Bank. Hello Everyone! It’s Thursday morning and [we] thought [we] would take advantage of computer access. Yesterday started with arts camp. The children really enjoyed Margaret’s tambourine craft. After the craft Denise, Karen, Jessie, Alex and Ater marched around the fields in a parade. The kids collected sticks the night before and made banners. Wes took lots of pictures. Today was chicken-delivery day. The trick was catching the chickens. After some effort Tony succeeded in catching five. Susan and Ater were also in the pen attempting to catch them. Lots of laughter and screaming! A very malnourished boy [came to] the compound. Linda was called to do an assessment. She took him to the clinic where he received treatment and will be checked again in two weeks. Today was interview day for the current scholarship students and new scholarship students. Margaret, Maggie and Denise conducted the interviews. The girls wrote thank you notes. We have had an opportunity to get to know Rebecca and Bhakita very well. Wesley-Knox [can] be very proud of these girls whom we support. 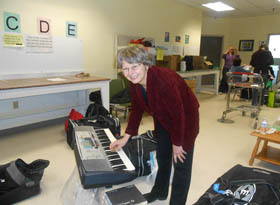 Sheila had a busy day organizing the volunteers and work-task assignments. Following dinner, Jane and Glen lea a discussion on what the trip has meant to us and how it has impacted our faith. Sent from Maggi Logan’s Hotmail address, forwarded by Josh Chadwick at London Food Bank. Good morning All! First no updates, now many in a row! We thought we would take advantage of having computer access this morning to send you a note. We are all doing just great. Last night we were invited next door to a dinner of chapattis, samosas, goat, chicken, beans and rice of course and spinach—yummy! Alice, [one of] our NGO friends next door, cooked [the] spinach. 3. Delivery of chickens—they are surprisingly still when you hold them upside down! 4. Interviewing CASS scholarship students. I think [there are] 16. They are dressed in their uniforms today, ready for their interviews! 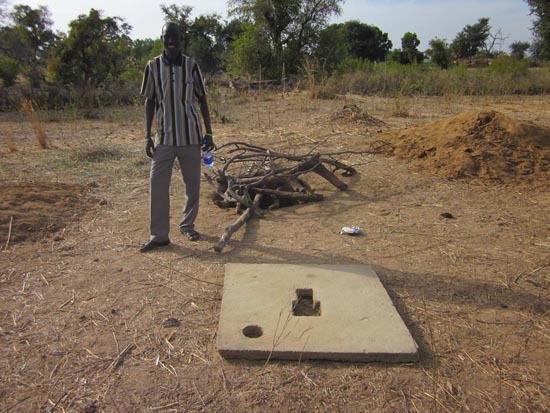 The digging of the latrine is finished! We have fallen in love with the people of Sudan. They are soooo friendly [and] appreciative. They look directly into your eyes and their laugh is without inhibition! The days are warm and sunny but the mornings are cool—a perfect temperature for working! Communications has been restored, People in London are starting to receive text messages and even telephone calls from South Sudan . First, a text message from Jane forwarded by Josh Chadwick. Tuesday, January 16. Hello, Everyone! One team has just returned back from [the refugee camp] Rimrol after having slept under the stars. We interviewed the refugees and returnees, and also met with a women’s group. It was colder than we expected. Jessie, Alex, Ater and Wes played with their flashlights well into the night (something about writing for a photo…..) Karen, Maggie, Tony, Jane and Denise all went on this trip. There they presented us with a goat, which we all pretended to eat, though tonight we are going to AMURT [Ananda Marga Universal Relief Team, another NGO] for dinner and much of the team is going to try goat there! 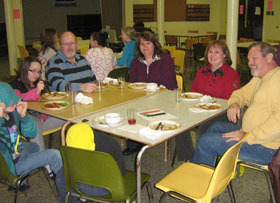 Glen stayed back at the mission with Sheila, Linda, Susan Smith and Margaret. They continued to distribute goats of Abuk’s herd, worked on the latrine and water projects (which are going very well) and got [other things] ready for the camp. They also spent time at the medical clinic interviewing patients and seeing the difference that all the medicine we brought makes. In fact the clinic has already started to use some of [our] quinine [to treat malaria] as they had run out before we came. Carol and Sue Gaskell continue to help out with logistics. Sue has helped the camp get ready for the crafts [program] over the next couple of days. Everyone is well and in good spirits. Wes has finally gotten over his cold. It took close to a week. As we have had problems with the network, you’ll probably find that reports from the last couple of days will come in after this one. Make sure that you look at the top of [each] report and note the day on which it was sent. How did she like being in South Sudan? The answer was, “I love it!” Karen reported that the team was in great spirits and much valuable work was being done. She said the people, despite conditions under which they live, are joyful, warm and hospitable and so glad to have the team there. (“They say hello to you fifteen times a day!”) She was particularly pleased with the response to the arts and music camp which, by all standards, has been a great success. After over a week of eating rice and beans—which she said she is actually coming to enjoy—the team is looking forward to the meal that Jane mentioned above which will include goat, chicken, tempura, samosas, chapattis and real vegetables! She sends her love to all. Jane’s January 9–14 reports have finally come through. Here they are. Church [yesterday] was incredible—dancing and singing! Jane and Ater spoke to the congregation. Denise and the choir were a big hit. Afterwards, more goats were delivered. 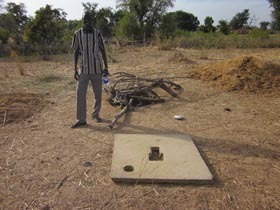 The latrine is almost at three meters. The group split into two. One group left with interpreters to spend the night in [the] Rimrol [refugee camp]. Alex and Jessie were offered hundreds of cows for their hands in marriage.Linda, Susan and Tony continued digging the latrine. 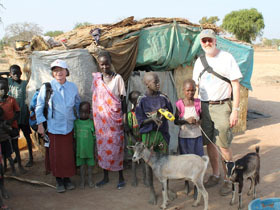 Sheila, Margaret and Maggie delivered goats to two families. They were very surprised when they received them. 35 moms attended a clean water seminar at the compound—which was very inspiring. Ater and Wes are very popular with the local young women. Everyone is well and settled in. Great day at camp. We organized the distribution of water. Karen taught the kids This Little Light of Mine. Met a beautiful baby named Lucy that Denise held. Wes met with another NGO [non-government organization] to explore different sanitation techniques. We delivered goats. James came to visit dressed for his wedding. Susan travelled to a market with an interpreter on public transit. Well, another day where everyone is starting to feel better. We are not sleeping well. We are starting to get into the rhythm. The [arts and music] camp had another 300 kids. It was not as much pandemonium [this time]. Still learning to help so many children that don’t have very much. Two years ago today was the referendum. Everyone expected a holiday but now there will be a celebration and national holiday on July 9, the [actual] day of independence, Wes is feeling better and has been out taking photos. Tony and Wes delivered meds to the clinic. Susan worked at the clinic. Maggie, Sheila Alex, Ater and Jessie [went] with the [Roman Catholic] father to a baptism of 200 people. Denise, Sue, Karen and Margaret ran the camp. Jane, Glen and Karen worked on the high school. All in [all] a good day. This morning we received a short e-mail from Tara LeClair. We share it with you here. Hello, Everyone, We got a phone call from my mom [Sheila LeClair] today. She said the cell tower has been down consistently for the last couple of days and just came back on today but is still inconsistent. She wanted all of you to know that everyone is safe, healthy and doing well. They are all working hard and getting into a routine doing their designated tasks. The latest is that a number of them have gone on a trip to a refugee camp. I believe only four people stayed behind—my mom, Margaret Eadie, Linda [Olson] and one other person. This info is all second-hand from my dad who took the call! I was asked to say that they miss everyone. I’m hoping we will start getting more information this week! 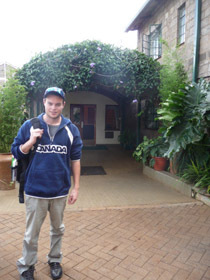 At 2:38 this afternoon, Josh Chadwick forwarded a short text message from South Sudan. The entire message was, “Alex [Alexandra Eppel] was offered over 100 cows. Jessie [Read] was offered over 400 since she has a university education.” Context: In South Sudan, cows are given as a dowry. The more cows, the more value assigned to a potential wife. No word yet if either offer was accepted! It’s interesting to see who’s following this trip. Here’s a blog page from Glen Gordon who writes from Oregon. Well, we’ve had our first 24 hours in South Sudan. It was overwhelming and emotional for many of us to see so much need. The arts camp (see photo 1) started off with 300 kids on the first day. The kids gathered early, were waiting for everyone to come and started singing before the team arrived. 300 was much more than we were expecting on the first day so we are wondering where it will end up. Denise, Karen, Jessie, Sue and Margaret spent the morning with the kids. Many other team members popped in during the time to lend a hand. Tony, Maggie, Alex and Ater went off to the market at Malualkon (see photo 2) to buy some goats. They walked back with the goats. It was a hot and long trip, but they thoroughly enjoyed seeing the way people live as they walked back. They passed many homes (tukals) and many families at work. They also experienced the goat and cow auction. Pandemonium to say the least! 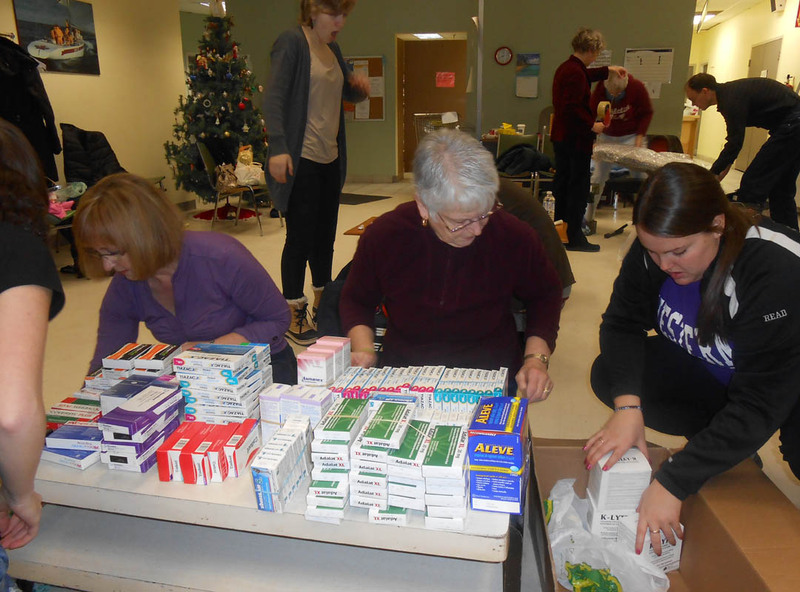 Susan and Linda helped out in the medical clinic. They were able to get a tour and visit some of the patients. Both are going back tomorrow to assist. This too was an eye opener. It is not the Canadian medical system. It is very primitive in nature (see photo 3). Wes helped at camp and took some time to play with the kids, but found himself spending most of the day trying to get over a cold. The flight yesterday was very tough on his ears. He is drinking lots and it looks like he will be up and at it tomorrow. BTW, he thinks he got the cold from his mom! Today we had a delicious rice and bean dinner! But added was a fresh boiled chicken! Carol was busy organizing everyone and has done a great job of it. Jane was out helping set up things as well, with the high school builder, AMURT and IOM (two other organizations we work with). Glen is doing well and spent the day at the mission talking to folks as they returned. He helped lead the talk in the evening where we were all able to process the day. Please note that at times the network goes down and if you don’t hear from us for a couple of days, that will be the reason. We will catch up on each day as we are able to get the e-mails and text messages through. 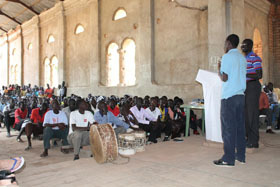 South Sudan held its referendum (see photo 4). Looking forward to the days ahead.—the Sudan Team 2013! P.S. We have now met Ater’s grandmother. Their first meeting was rather emotional for both and today she brought Ater a goat as a present! The team will be flying out of Detroit and the medical supplies (dare we say “drugs”) may cause a problem at the border. 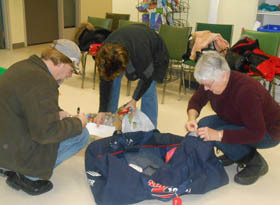 Jane, Glen, four others of the team and the medical supplies leave early in anticipation of possible delays. We arrive at Robert Q’s shortly after eight. Everyone cheers Karen’s arrival. We take a few snapshots of the group, their families and their friends. Then it’s hugs and kisses and into the waiting van. We go outside to snap the van heading for Detroit. We know they’ll be going through Windsor because the First Nations people have blockaded the Bluewater Bridge. The van goes by and we get our snapshots. Earlier in the week we sent a note to James Reaney at the London Free Press, telling him about the arts and music camp that Denise Pelley and Karen will be. He passes the information tono another writer who contacts us. We send her lots of info and lots of photos, but on Friday, only a small article appears and there are no photos. We say that something is better than nothing and remember that the trip got good coverage in London Community News the week befor That story is available here. 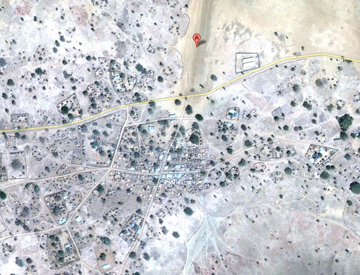 If you’d like to do your own exploring, go to Google Maps and search for Malualkon, South Sudan or click here. Switch to satellite view. Zoom in to see the airstrip where the team will be landing. Then find the road that goes through Malualkon and head west about six kilometres. Do a sharp left and follow this road to its very end, to Gordhim where the team will be working. It’s been a busy week. Karen, who is Director of Music at Wesley-Knox and also has her own community choir, the Karen Schuessler Singers, is going to South Sudan. There’s lots to take care of beforehand. People to rehearse the choirs while she’s away. People to play the organ on Sundays. And shopping. Weight is a big issue on this trip. Team members are flying KLM because KLM lets you check two large pieces of luggage without extra charge. One piece of each team member’s luggage will be for the educational and medical supplies CASS is taking. The other is for personal stuff. Weight is also an issue on the small airplane that—in two trips—will fly the team from Nairobi to South Sudan. With all the people and supplies on board, they can’t carry enough fuel to make the trip in one hop. Instead, it’s three short hops, refuelling at each stop. Every pound counts and too heavy and they don’t get off the ground. Karen’s suitcases are old and heavy. Time for newer, lighter ones. Clothing? Jane said keep it light and plan to leave it there when you leave. We visit the Goodwill and Karen finds a leopard spot top she thinks will be perfect! Then we head to Walmart for the pants that Margaret Eadie bought. They have none. We call Margaret using Wallmart’s phone. Turns out she got them at Costco and we get them next day. Footwear? Jane said one pair of sandals does the trick. But which kind? We visit Novack’s, Mountain Equipment Co-op and Novack’s again. We now know the perfect sandal, but no one has the right size. Fortunately one pair is available on Amazon and they arrive a few days later. Electronics? There’s electricity where the team is going but it’s supplied by a generator for only two hours a day. There’s little point in everyone bringing laptops and if there’s internet, there’s probably no way for the average laptop to access it. Roaming fees make cellphones a bad idea. Karen settles for a camera, an iPod, her Zoom audio recorder, her Kobo reader, some batteries, a couple of chargers, some cords and a plug adapter. She also takes her new LED flashlight which can convert to a candle and flash SOS in an emergency—a thoughtful Christmas gift from her husband. What did members of the CASS – Wesley-Knox team eat during their two weeks they in South Sudan? Rice and beans, rice and beans, and sometimes, just for a change, beans and rice! On Friday, January 11, some 60 family members and friends of the team came together in the Wesley-Knox Social Hall for a Sudan Solidarity Supper. Big on the menu: dishes that featured rice and beans. In the lineup: rice and bean salad, several variations on chili, Cajun rice, beans and shrimp, and Rice Krispy squares for dessert. There was also a fine lamb stew, no goats being available. Yes, a great time was had by all. Thanks to Barb McGill and helpers for organizing this event! Many people in our congregation, and indeed beyond, wanted to be a part of this trip, and in a very important way every one of us is taking part. When the call for participants was first made last autumn over twenty people expressed an interest. A year later we now have a wonderfully diverse and energetic team consisting of the following ten people: Margaret Eadie, Alexandra Eppel, Tony Haworth, Sheila LeClair, Maggie Logan, Linda Olson, Jessie Read, Karen Schuessler, Susan Smith and Wes Wilcox. 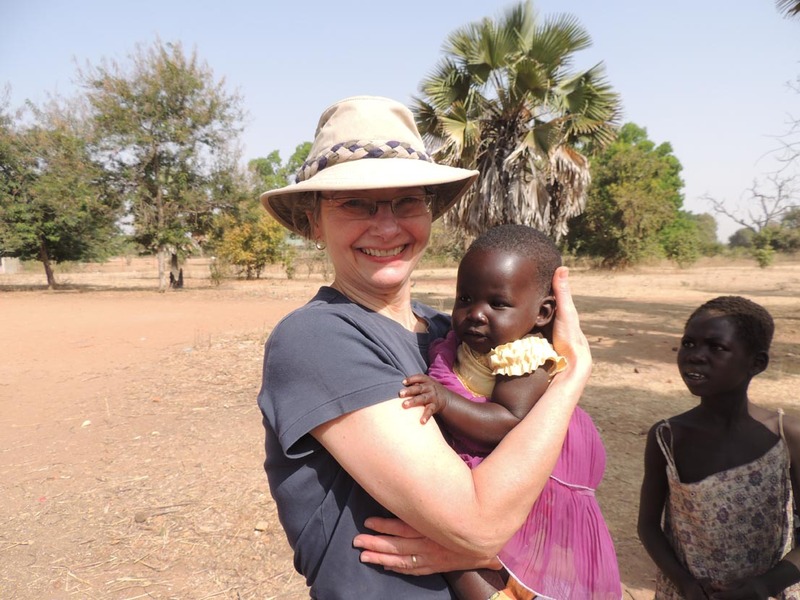 Of course, this list doesn’t include Wesley-Knox members Jane Roy and Glen Pearson who are the principals of the trip as directors of CASS—Canadian Aid for Southern Sudan. There are also many hardworking people who are directly involved in the planning and fundraising aspects of the trip but who are not expecting to travel with us. 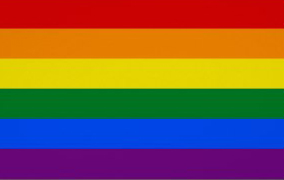 Their commitment is gratefully acknowledged though I won’t name names here for fear of excluding someone! You may recall that we are relying on CASS to arrange all aspects of the trip including flights, accommodations and meals. CASS has the contacts, expertise and experience to take us there, engage us in worthwhile projects and bring us home safely. In return, CASS is asking each person to pay a trip fee of $5000. For the ten team members the total of fees for the trip is $50,000. The purpose of our fundraising activities has always been to raise a portion of this fee for two main reasons. First, not everyone can afford to pay $5000 for this two-week trip and we wanted the trip to be accessible to anyone who had the desire to go and was physically capable. Second, we wanted the entire congregation of Wesley-Knox to participate in this endeavour and fundraising was a tangible way to do that. Note that the trip costs CASS less than $5,000 per person; the exact cost to CASS is variable depending on cost of flights, supplies, etc. at time of the trip. They will then apply any surplus amount directly to projects in South Sudan. In fact, CASS advises that the money we’ve raised so far, about $5300 in total, is unlikely to exceed the “projects” portion of the $50,000. All this means that the funds we’ve raised to date will directly support the mission work in South Sudan. Note from the Webmaster: Earlier this year, we asked Jane Roy if she could tell us the exact area where CASS and our Wesley-Knox volunteers would be working. 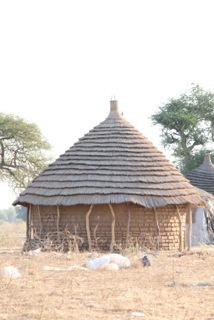 She said near Malualkon, South Sudan. We did a search in Google Maps and here is what we found. Try the satellite view from which you can get an idea of the terrain. Zoom in and you can see actual streets and houses. And while this may not be the exact location where our volunteers will be working, it gives a real sense of what the area is like. Google Map link to Malualkon, South Sudan here. **Update! ** CASS representative David Whiting has been able to show us the exact place where our people will be working. Bring up the Google map using the link above. From Malualkon, head west along the main road. 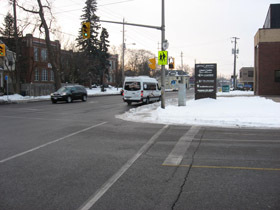 Then take the second left (it’s a sharp left) and follow this road southeast. The village at the end of this road is Gordhim. 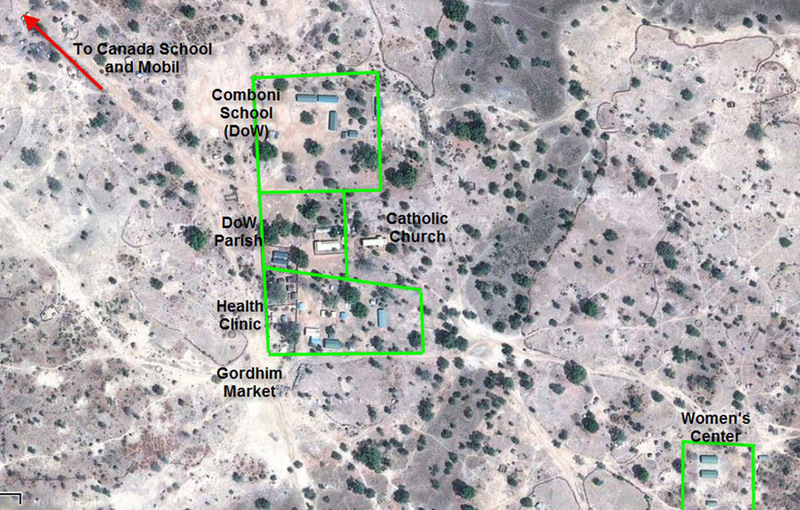 If you are in satellite view and zoom in, you can see the entire village in excellent detail! This year, on June 2, 10 am – 5 pm, our church will have a significant presence at the GOTG south of the old Normal School at Wortley Road atElmwood Avenue. We’ll be selling beautiful handmade African crafts including jewellery and wood carvings. 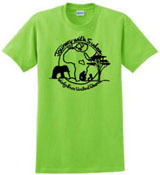 We’ll also be selling Journey With Sudan wristbands and T-shirts featuring the art by our own Linda Imrie. All profits will support Journey with Sudan. Come out and enjoy the gathering and look for our booth. We should be easy to find. Just look for the new Wesley-Knox banner!. 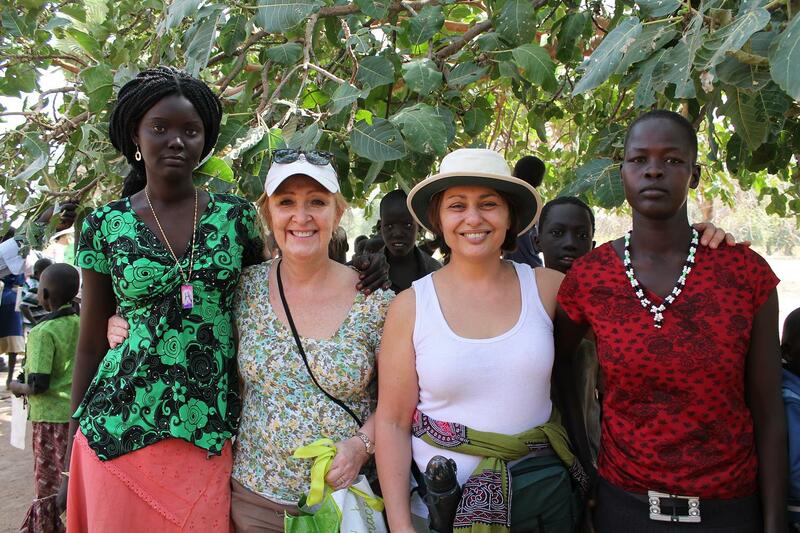 We’re sending two South Sudanese girls to school! Illiteracy is a big problem in South Sudan, especially for women with minimal access to education. Just 16% of the country’s female population can read. 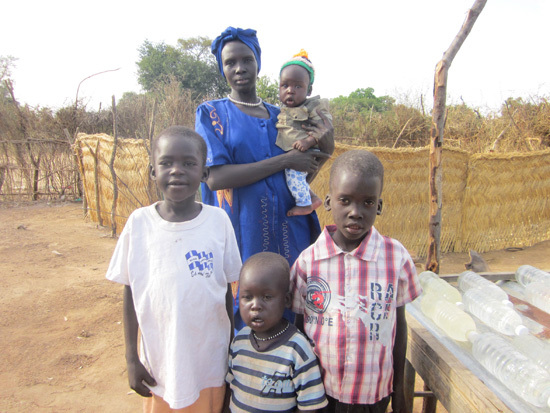 This is why our congregation will be sponsoring two South Sudanese women by paying for their ongoing education. Their names are Rebecca Nyial Nuot Kol and Bhakita Adeng Lual. Rebecca is a 19-year old young woman who has just graduated from primary school. She lost both parents in the war and grew up with her aunt and uncle. 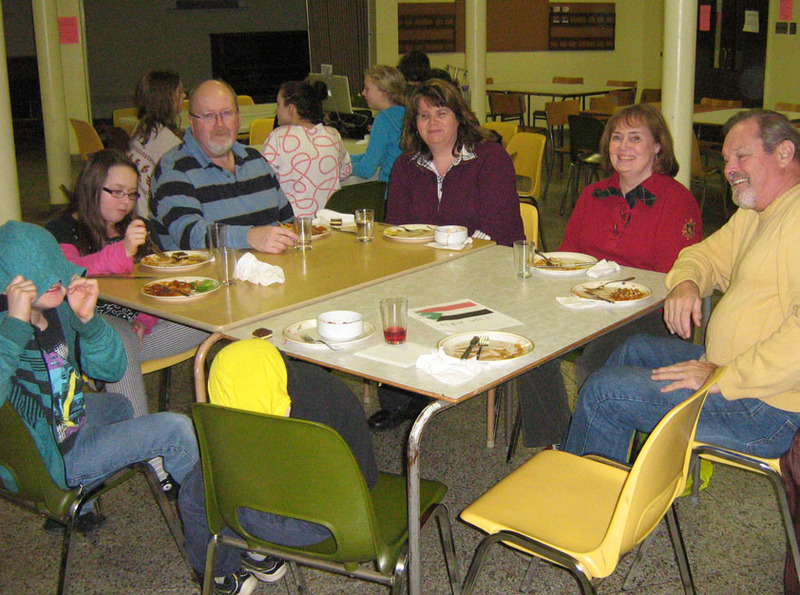 There were too many mouths to feed, so Rebecca went to the area Catholic mission to help the priests there. It is her desire to someday become a teacher or a nurse so that she can help others. Bhakita is one year younger than Rebecca and is going into primary 8. She also lost her parents in the war. She had been abducted—taken from her mother—when she was little, but through the course of the war was able to return. However, shortly after her return, her mother became sick and she was left to fend for herself. She went to stay with her grandmother who was very old and sick. Bhakita wanted to become a nun, so she also went to the Catholic mission to help with the work of the nuns and priests. So far we’ve had two “open” meetings for anyone thinking of becoming involved with the trip to South Sudan. 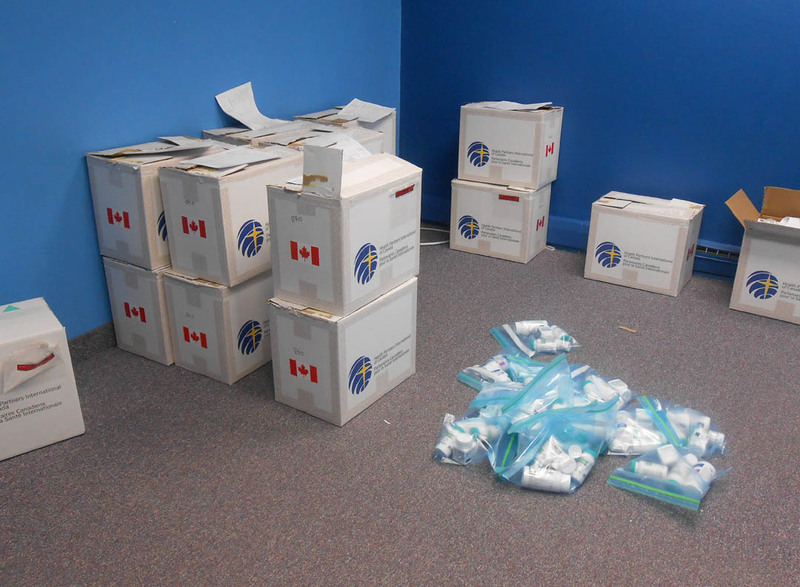 The response has been extremely positive with more than a dozen people ages 16–82 expressing an interest. We’re now starting to grapple with some of the details around raising funds, planning our work “over there”, and keeping the entire congregation involved! We’ll continue to meet monthly until we make the trip in January. Please keep this group in your prayers. Back on November 20, the Mission and Service Committee officially kicked off its new mission project, Journey with Sudan. As you probably know, a group from Wesley-Knox will be traveling to South Sudan a year from now under the auspices of Canadian Aid for Southern Sudan (CASS). The composition of this group is yet to be determined, but all interested individuals were invited to make themselves known to the M and S Committee. A signup sheet was posted outside the Centennial Parlour and, to date, contains more than twenty names! It doesn’t necessarily follow that every one of these people will be making the trip. The intent is to allow people to express an interest so they can explore the idea with the help of CASS and our M and S committee. Originally it was announced that the size of the team would be limited to nine or ten people. This number is based on the capacity of the airplane that will ferry the group on the last leg of the trip from Nairobi to South Sudan. However, it might be possible to arrange additional capacity if enough people were deeply committed to going. Anyone interested in learning more is invited to attend an information session in the chapel on Sunday, February 19, immediately following worship. Jane Roy is just now returning from the region and will have up-to-date information. Those who signed the signup sheet will be contacted directly with an invitation, but all are welcome! • Donations will be gratefully accepted via the collection plate. Specially marked envelopes will be available at the entrances to the sanctuary. If you use a plain envelope please make sure it is labelled “Sudan Project”. • On Saturday, April 21 and Sunday, April 22, the M and S committee will be collecting used household electronics in the church parking lot. Large collection bins will be set-up and all types of household electronics will be accepted including computer equipment, televisions, cellphones and audio equipment. There will be no fee for dropping off items and they will be recycled in an environmentally-friendly way. As an added benefit, the Journey with Sudan project will receive a per-ton commission from the recyclers. It’s win-win-win! By the way, April 22 is also Earth Day, so here’s an easy and practical way to do your part. Help us spread the word about this event! Transforming lives through our relationships with God and one another. 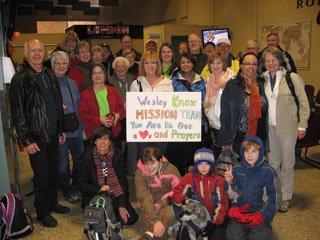 Wesley-Knox — a vibrant Christian community striving to live gratefully, deepen faith and reach out to God’s world.